Vrindavan Town is a small town located 145 Kms south of Delhi and 55 Kms north of Agra, just off the Delhi-Agra Road. It is at a 14 km or half hour Taxi ride from Mathura. It has a small-town-type atmosphere with narrow streets in most of the places. The town is situated on the banks of the river Yamuna in the forest of Vrindavan which is one of the 12 forests of Vraja. With more than 5000 temples in the town, it is also known as “The City of Temples”. Radhanath Swami describes in his autobiography The Journey Home how it is a great delightful treat for the ears and the soul to hear thousands of bells and gongs ringing simultaneously across Vrindavan as the Aaratis (worship of the Lord by offering incense, ghee lamps etc.) are being performed in these temples during morning and evening hours. Most prominent amongst these are the temples built by the six Goswamis of Vrindavan such as the temples of Radha Madanmohan, Radha Govinda and Radha Gopinath. Many of these temples are masterpieces of elegant architectural design and exquisite stonework. Also, if you are looking to buy some nice devotional paraphernalia to worship your deities, a big market of the name Loi Bazaar is there in the middle of the downtown area. Five hundred years ago Lord Krishna appeared as the Yuga avatar, Lord Sri Chaitanya Mahaprabhu. When Lord Chaitanya came to Vrindavan in 1515, it was practically a forgotten place, it was a deep jungle. The holy places of Krishna’s pastimes were practically lost & forgotten. Lord Chaitanya discovered many of the places where Krishna performed His divine pastimes. Later on He sent His prominent disciples, who later became the six Goswamis of Vrindavan, to excavate all the other places of Krishna’s pastimes and establish magnificent temples in Vrindavan. Radhanath Swami on one of his yatras to Vrindavan said that it is to Sri Chaitanya Mahaprabhu and the six Goswamis of Vrindavan that we owe so deeply for revealing Vrindavan Dham to all of us. Many of the important places of pastimes of Lord Sri Krishna such as Kaliya Ghat, Chir Ghat, Shringar Vata, Keshi Ghat, Raman Reti and Seva Kunja are situated in this town. In fact the temples of the six Goswamis also lie in the Vrindavan town. Radhanath Swami explains that one cannot really enter Vrindavan simply by flying in by a plane or by any other type of motor-vehicle, or even by foot. One can enter Vrindavan only in a state of consciousness of deep humility and appreciation. 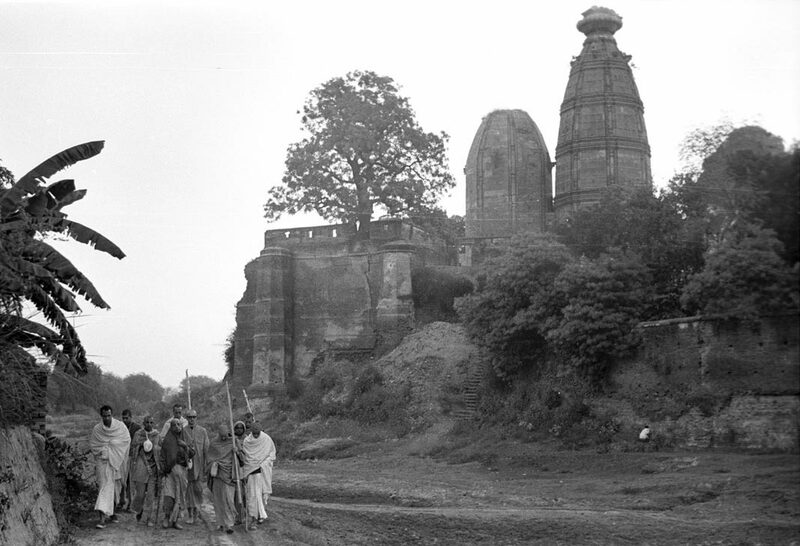 Radhanath Swami states that Akrura’s journey to Vrindavan is the ideal for a devotee aspiring to go to Vrindavan. When Akrura was on his way to Sri Vrindavan his heart was trembling with eagerness for the darshan of Krishna and Balaram. His mind was immersed intensely in remembering the Lord’s names, pastimes and especially hoping for the Lord’s mercy. In this way by the time he actually came to the precincts of Vrindavan, he was so very much fertile in his heart to receive mercy. When he saw the trees and flowers, the creepers of the forest, he was not thinking that OK these are nice trees, he was actually in spiritual ecstasy and when he saw the lotus footprints of Lord Sri Krishna in the soft sands, he literally fell from his chariot and rolled in the dust, weeping tears of joy. With such intensity one should approach Sri Vrindavan. Then one can have darshan of Nandanandan Shri Krishna performing His eternal pastimes in Vrindavan.